My wife and I chartered a Sun Odyssey 34.2 sloop from Sunsail Sailing Vacations in Rogoznica for two weeks. Our itinerary took us from Marina Frapa, Rogoznica, north to Kakan in the Kornati Islands, then back south to Venisce and Trogir, and on to Vinogradisce, Jerolim, and Palmizana in the Pakleni Otoci. We made side trips to Komiza and Scedro before returning to Rogoznica. The weather treated us well. Winds were in the 5-15 knot range and changed direction almost daily. We abandoned our sail plan early on and let the wind determine where we would go next. We did have one mild blow that kept us in port one day. The Dalmatian coast is a delightful place for naturists. Although there are fairly clear distinctions between textile beaches and naturist ones, the boundaries are casual, and those of us who feel encumbered by clothes can find congenial places to go just about anywhere on the coast. For sailors, it is even better: just about every anchorage we visited was clothing optional, leaving everyone free to wear as much or as little as sunlight, temperature, and mood dictated. In more densely populated marinas, such as Trogir and Palmizana, with boats moored side by side, people tended to keep their bathing suits on; but, in Palmizana, a ten minute walk leads to the outer beaches of Vinogradisce where naturism rules. Vinogradisce turned out to be the geographical center of our sailing. It is a lovely harbor where one can anchor in 2-12 meters on a sand bottom, with fine restaurants on a hill overlooking the sea. The harbor is formed by two headlands forming a U reaching out to the SSE. Although the beach on the inner part of the harbor, the base of the U, is a textile beach, the beaches to seaward on either side are naturist and designated as FKK on maps of the area. This anchorage is becoming increasingly popular and can get crowded. It is best to arrive mid-afternoon before it fills up, or to anchor in one of the three inlets to the west (Uvala Stari Stani, Uvala Tarsce, Luka Soline). Jerolim, the easternmost island in the Pakleni Islands, turned out to be one of our favorite places to spend an afternoon. The entire island is designated as a naturist area, and can be reached by ferry from Hvar, less than a mile away to the north. Uvala Kardovan (note from the editor: uvala is Croatian word for cove), the bay facing SSE, affords daytime anchorage in 7-16 meters. There is a beach concession providing chairs and light refreshments. Uvala Stipanska, a south-facing bay on Otok Marinkovac, just to the West of Jerolim, is also popular among naturists ferrying over from Hvar, and offers a good daytime anchorage. From Vinogradisce, it is but 20 miles to Komiza, a lovely port on the west coast of Otok Vis (note from the editor: otok is Croatian word for island). Here one can tie up to the quay or anchor in the sheltered harbor. The village has all the amenities one could ask for, and fewer tourists than places closer to the mainland. The naturist beach has only recently been designated as such and has not yet begun to attract large numbers of people. There were perhaps 6 or 8 people on the beach the Sunday afternoon we were there. Approaching Komiza from the SW, one sees the village in the NE corner of the bay. The naturist beach is roughly 1.5 miles to the south. The best landmark is what appears to be a monastery, a large building complex surrounded by tall trees (perhaps cypress or Lombardy poplars) set into the hillside to the south of the village. A bit further south, along the coast, one sees a cleft in the hillside overlooking an inlet with more of the distinctive tall trees strung out close to the water. This is the naturist beach. 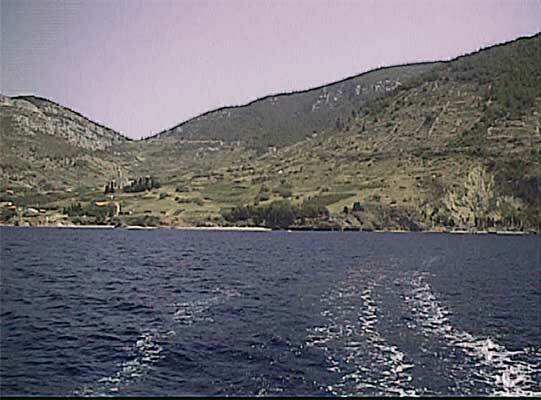 In the photograph, the monastery is on the left (north) just below the declivity in the hills above and the beach on the right (south). We anchored on sand in 4 meters. We made another pleasant overnight trip from Vinogradisce to Otok Scedro and anchored in Uvala Lovisce, about 20 miles ESE from Jerolim. The beaches were deserted when we were there, probably because it was an overcast day. After we returned the boat to Sunsail, we drove to Cavtat, a picturesque seaside town 5.5 miles SE of Dubrovnik. We stayed at the Hotel Croatia, which has its own naturist sunning places carved into the hillside leading down to the sea. The restaurants in Cavtat are superb, the views spectacular, and there are several naturist beaches in the vicinity, notably Lokrum, Mlini, and Supetar. We stopped briefly at Mlini and Lokrum on a water taxi en route to Dubrovnik but did not explore, although Lokrum looked particularly attractive. We spent the afternoon of a gray and windy day on Supetar, and had the island pretty much to ourselves; only two other groups ventured across the choppy water. There is a bar/restaurant on the island that occasionally hires a band for evening frolics. We have already booked a boat for next summer, just because we could not think of any place in the world that offers more delights to seafaring naturists.